I hope you all had warm and wonderful Christmas celebrations. Amoeba and I were busy on Christmas Eve with both church services. Amoeba played his horns and sang (Praise Band for the first service, choir for the second). I ran the new audio-visual set up for the second service. Man that tech is sweet! I wanna get me that! It was all Mac — a 28 inch monitor, a blue tooth key board and the most responsive little mouse ever. 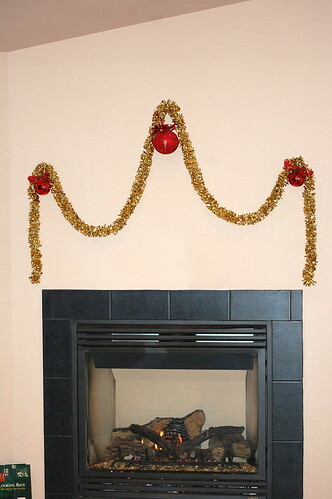 Above the fireplace I hung a swag of garland and decorated it with large red jingle bells. Christmas Day we slept in, then had a lovely bacon and egg breakfast — treats not often on our menu. Then we lazed around. Amoeba watched some sports on TV. I read a novel in front of the fire. Later we had a nice meatloaf dinner with cheesy mashed potatoes, then we (mostly Amoeba, I read for awhile more, too) worked on the Christmas Tree puzzle until bed time. It was quiet and pieceful (pun intended). Here is our coffee table, decorated for the occasion. 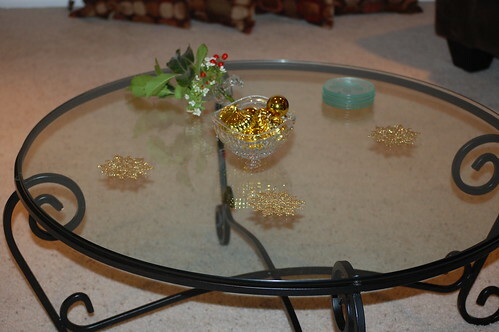 This table is the most recent item added to our decor. I bought it at the second hand store the afternoon before the party. I have been searching for months for the perfect table, and here it is. Mona (she of the coffee shop) ordered me to go to the second-hand store. I told her I didn't have time. She said, "Howard has new stuff, and believe me, you have to see it." I wasn't going to go. Mona told me if it was still there after the party and I saw it, I would be furious for not having gotten it sooner -- but she wouldn't tell me what IT was. I stomped over to the shop ... and promptly told Howard to wrap it up and toss it in my car! Mona has been helping me table shop and she knew this was exactly what I wanted. But what you really want to hear about was our Christmas party. We were pleased with the turn out. Judging by the compliments still coming in, our guests were quite pleased with it, too. I have had several of the women say I made the party look easy. Of course, I did a lot of the prep work the day before — and for the party itself I recruited a couple of friends to help get everything sat out so when the guests arrived we could look relaxed and serene. These packages above the entry closet got a lot of attention and compliments. One of Amoeba's colleagues wanted to know if I had to put the presents up there to keep Amoeba from peeking. Everyone was saddened to hear they are just pretty, empty boxes. The bag is full though -- it has a 3-Pack of Kleenex in it! I couldn't make it stand up without adding weight. I set up the buffet table with hot plates and crock pots so it was self-monitoring. I had 8 pounds of meatballs (store bought but simmering in my own, homemade marinara) and 5 pounds of chicken wings, 50 bacon wrapped crab balls (made with imitation crab since I didn’t have medical records on all of my guests), both potato and mac salad, Summer sausage, assorted cheeses, veggies, dips, and crackers, hot cider, coffee and tea (hot & iced) and one guest brought sparkling cider. There were peanuts, pretzels, Chex Mix, olives, sweet & dill pickles, assorted cookies … a small mountain of food. I kept worrying about what we’d do with the leftovers, but there weren’t enough leftovers to worry about! 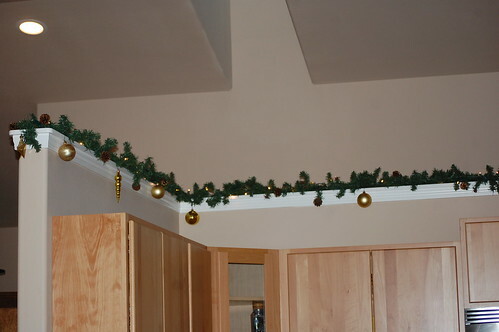 Pine garland, lights, and ornaments on top of the 3/4 wall surrounding my kitchen. I figured the approximate number of guests by counting plates — I bought 96 and had 48 left. Five or six of the guests didn’t eat because they were just coming from or heading to meals. Our next-door neighbor came but she didn’t eat, either. It was her son’s 18th birthday and they were having their own big bash. And, of course, a few people could have used more than one plate. We estimate 50-60 people came through the house in about 4 hours. I wish I had thought to have a guest book! Pine garland, lights and ornaments viewed from the living room side. We had a basket with brand new activity books, crayons, and pencils for the kids. There were also a couple of stuffed animals and an Etch-A-Sketch. I don’t think a kid ever got to touch the Etch-A-Sketch, but it was a sure hit with the adults. 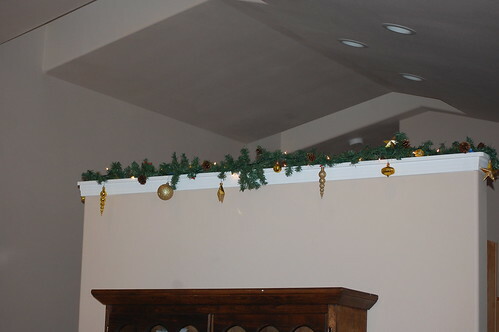 The Pine Garland viewed from the hall. We also set the card table up, covered it with a red plastic table cloth and put a 1000 piece border-less puzzle out. Several of the guests worked on it. And we gave impromptu tours of the house. Of course the kitchen and the master bath were the two favorite features. I had several people ask if we needed house-sitters when we travel. They were all female and eying the bathtub when they asked. 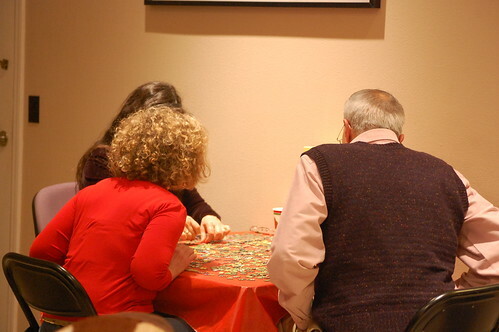 Three of our guests, Rosalie, Allison, and John, working on the puzzle. We even had a bit of music. Jim brought out his guitar and harmonica. Amoeba got his horn. 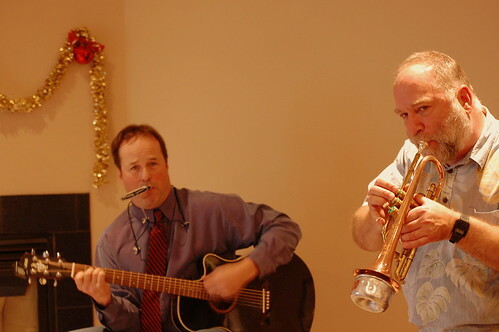 They played together and Jim even sang a couple of tunes. According to the comments we received, a good time was had by all. Jim and Amoeba making good music. This is a horrid photo of Jim. My apologies. Some of you might remember him from another party post here. He wasn’t quite as Christmas “clean-cut” then. 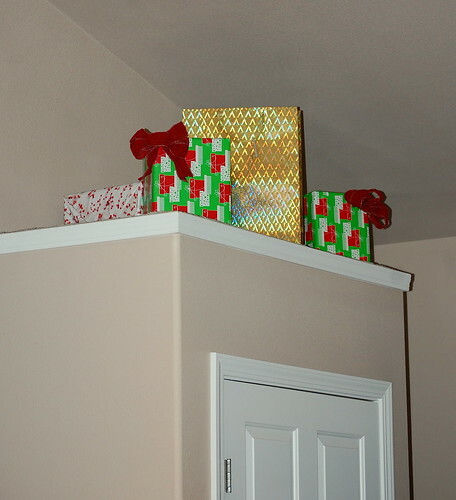 I love the “presents” above your entry closet. What a nice touch. Looks and sounds like you had a great Christmas. Thanks, Kala. The “presents” are one of my favorite touches. Looks as if you had a wonderful Christmas ! I think it was the first in your new home. We had a nice time in Amsterdam, I made a report today on my blog. Gattina — it was our first Christmas in our new home, and it was your first Christmas with a new grandbaby. I think your first was much sweeter than ours! Thank, Mar. Merry Christmas to you, too! Love your decorations Quilly and your party sound fabulous! Akelamalu — no! We deliberately did an early afternoon party so there would be no call for alcohol. Although both Amoeba and I happily have an occasional drink, neither one of us want an alcohol related party in our home. For some reason too many people think they should start the New Year drunk out of their minds. I like you decorations. Simple and elegant. I wish I could have come to your party. Looked fun! Betty — simple and elegant was what I was going for. Thanks! Looks like u had a great party! Love how the garland looks on top of the wall! Ria — I envisioned that garland months in advance and I can’t tell you how pleased I am that it looked just as I hoped it would. Looks like a great time! Love the decorations and the food ideas sound yummy. Jim is wanting to host a open house next Christmas for his group at work rather than taking them all out to eat, and I am already excited and gathering up ideas. I especially like the idea for the kids’ basket. Barbara — the kid’s basket was a hit and charmed the moms and several others who marveled at the simple thoughtfulness. The puzzle was a hit, too. Sounds like it was a wOnderful party – and I DO love your decorations — especially the empty boxes above the closet! What a NEAT nook!!! Nooks weren’t IN when we built our house… I would LOVE to have some though! Melli — yeah, but when Christmas is over it will return to being a big empty space. Most of our decorating is done, but I still need something for that spot and something to hang above the fireplace. I want a huge clock, but Amoeba says not in the living room where our guests will feel unwelcome. Oh Quilly! I’m so glad you and Amoeba had an enjoyable “pieceful” Christmas. We too had a nice Christmas, only I had laryngitis Christmas Eve and Christmas Day. You know it was torture for me not to be able to sing any of the hyms on Christmas Eve! And even today, I sound like a man when I talk. It is one of those nasty colds in which I sound worse than I feel. I’m so glad you posted photos of your decorations! They all look so pretty! I especially love the garland on the ledge. Oh, and excellent choice on the coffee table! I LOVE it! CL — I am so sorry you are sick and didn’t get to raise a joyful noise in celebration. Rest assured God heard your heart singing! 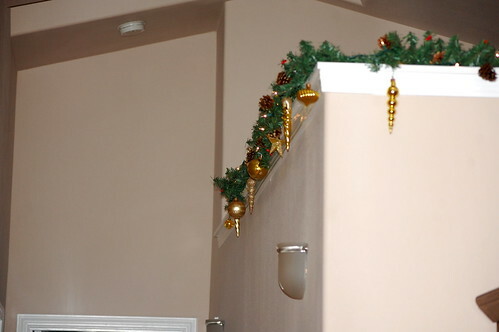 I love the garland & ornaments on your 3/4 wall. That is an inspired idea! And if you ever decide you don’t love your new little secondhand table…. Karen — thou shalt not covet! 😉 Thanks! Looks and sounds like lots of fun! Linda — that it was! Sounds wonderful. Glad it was such a success and that you and your guests all had fun. Yeah, I loved this post, too. Thanks for the link. Glad the party was a success and all enjoyed themselves!